So, here's Applejack in her fancy getup all ready to be part of the Royal Wedding Poster Collab. Most of her is hidden on the poster, but I don't like making half ponies so the rest is based on mashed up screenshots with bits and pieces of scratch vectoring. Its okay if i make a base? can i use this please ? 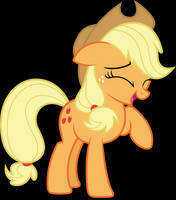 I LOVE Applejack in this outfit! Hi Zu, sorry but I'm not interested in reworking any of my old traces so feel free to remove anything you don't like the look of. I've rather gone off the idea of vector resources as (with the notable exception of backgrounds) I so rarely see anything good done with them. We get a whole pile of unacknowledged stuff submitted to the comic group I run too which makes me even less keen on providing vector traces... Sorry for the rant but I thought I'd best explain. Wow Apple Jack dress for Cadence and Shining Armor's wedding looks amazing. Ok, I understand. Thanks for the explanation. At one point she did put on her hat when Princess Cadence and the Cutie Mark Crusaders approached the hall. it has. alright thats great! 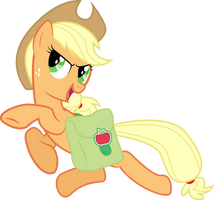 I really enjoy AJ's outfit better when she had her signature hat on. In the royal wedding episode she has a great sneaky expression when she puts it back on during the ceremony. indeed she did. Her bad poker face. Great work! Hopefully I'll be able to participate in one of the collabs soon. Collaborations are quite fun, many hooves do indeed make light work! I ran one myself a few months ago and it was great seeing all the pieces slowly come together.